Street photography was something I was doing when I first got my first camera. I would go along East Street, Bedminster, Bristol, UK, looking for interesting people and things to photograph, its fare to say back then I would just be clicking away at anyone or anything, without thought of why I was photographing. Street Photography comes in different formats for me. Obejects and places can look so different in the light or shadows that occur on the day, reflections can be stunning, but you have to look deeper into the surroundings to find something unique. Theses days, I can travel along a street without my camera out of its bag, and I just stop and and observe. To me this is a huge part of street photography in observing, you see a reflection and look deeper, you start to see other things that you only notice if you observe for a time in detail. Same can be said of an object, if you look pass it to see the shadows and where they fall, or the light reflecting, looking from below or above, can make the object seem more relevant. When we talk about the observer in photography, normally we are talking about the person looking at the image we’ve taken, but in street photography, the photographer becomes the observer in the first instance. Its whole new way of viewing, letting time stand still and focusing on whats around you in more detail. Street photography and people, works in the same way by observing. We are all different and have unique things about us. We all for the most part dress differently, some in more outrageous ways than the norm. We don't just dress different, we style our face, hair, skin, we wear jewellery, which penetrates our skin, like war paint we have ink engraved with the paws of our skin, all of this to be different and not fit the mould of ordinary. When we are alone within the confines of the street, we are constantly thinking about things, holding objects in a certain way, etc. that makes our mannerisms independent of each other. From a photographers point of few, theses are all things that makes them watch people and see how they fit within the surrounds, that make for a good street image. Street photographers have to be able to see things before they happen, with the hope that the person they are following is going to so something extraordinary that will make a good street image. It takes time and patients and some days you can get nothing, while others you can get many good images. Different seasons of the year, also make images more interesting from one season to another. When it comes to editing, a photographer has the choice like any other to make it colour or black and white. Some will say that in black and white, you can cut out all thats not of importance and captivate the viewer to the central character or object, I think this can be true as I look at images and see them in black and white in my mind, I find that a lot of my work is seen in versions in my mind before I take the image. It comes back to vision, vision of the subconscious part of my mind. I love street photography, but find I have to be in the right frame of mind to go out and do it. Building oneself up, saves a wasted of a day and hours observing and coming away with nothing because I don't have the feel for the job, a bit like writers block but from a photographers point of view. The Dollhouse In A Street. This image is one of my favourite of Bedminster. I was in the right place, on the right day and time. Looking into the shop window, I saw the dollhouse, but then I looked pass and began to see the street behind me become part of the dollhouse. 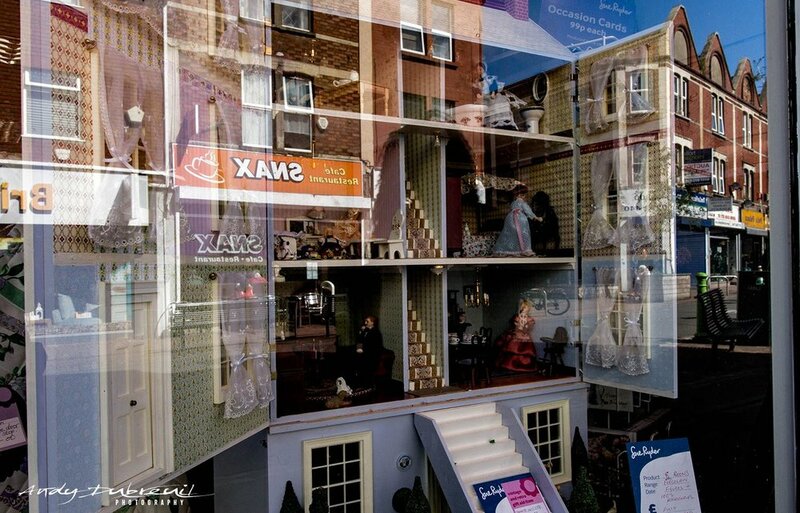 I move myself from one angle to another to see how the dollhouse fitted within the shopwindow reflection. It was a one off moment as the dollhouse has been removed from the shopwindow the next time I visited the street. I don't believe it would work in black and white as it needs the colour of the street and dollhouse to connect with each other. It was a moment, that can never be replicated and makes it for a one off, which gives it meaning now. For those that get the idea, they want to learn about photography, do it because they want to make it better, or expand the idea into a business, something which people have a number of avenues to go down. It’s fare to say I don’t know much about camera clubs, and would be unjust to pass judgement, but they can be a good starting point, if you like the idea of meeting likeminded people and there is no critical side to learning photography. People are a good source to ask questions of, but you need to ask the same question of many to see if the answers are the same, if not then it can be confusing to which to point of view to go with. Photographers will admit they have strong points and weak ones, but some might not acknowledge this, as they been doing it a long time and believe they are right, that can be said of anyone, and not just belonging to a club. For the most part you need some sort of camera, and if your looking to get a camera, you can be pushed into a corner because many will use the same make and model, which doesn’t mean thats the best for you. You can go onto the web and find courses of all types from one day, a number of weeks to part-time and full-time degree courses. The one day or more courses normally only cover a certain aspect from beginner mode and teaches you the basics of a camera, which you would fine within the manual, but find it better being hands-on, but they may offer another course to move up on, which can be expensive way to learn. The college of University course, can be done as part-time or full-time depending on your circumstances. But theses courses can be set to news or sports photography, which is photojournalism and maybe what your looking for. Or a course in professional photography, that covers al types of photography and historical attributes that are part of the course. This will lead to learning the pass and and now of photography and give you the openness for you decide where you want your photography to go in the end. It is structured, but you don't need to have your own camera for the most part as these types of course have full equipment to use and borrow. This is great as it gives you the opportunity to try gear you might not thought of, as well as learning old school large format, medium format, 35mm film and digital and medium format digital. The course will cover location as well as studio based and photo editing. Ive spoken more about this, because this was the way in with my photography and how I learned and eventually adapted to what I do now. The course I chose was based in my home city and was part-time, which suited my needs. The course was done at a local college but was part of Plymouth University but done at college level. This was great because those that know the difference between college and Uni, know that for Uni you are left to your own devices, where as college has more support, which for me having slight dyslexia did help when it came doing a research paper, otherwise I would failed that part. Being wheelchair bound did bring up some challenges for the course, college and me, but we worked together to make the ability to do things possible. The course was great for me, even though at times I felt I loss my way, but exploring the different avenues of photography, gave me vision, ability, focus. I came a way, not just knowing the ability of my camera and other equipment thats now part of my gear, but the future of where I wanted to take my photography. It open my eyes wider than the lens, towards the end I knew why I saw things in a detail that made an image to me. It gave me the tools, experience of those tools, to know where I was going at the end of the course, without, I would of been lost and probably had given up the idea of a photographer. The idea of having a degree, for someone that didn’t do well at school all those years ago, does make you feel good, and to pass with a merit, meant I had done better than good, and something that I'm extremely proud of. I did have low points because of my health, but the support of the college and the mainly the tutors and staff, helped me to keep the focus and pushed me to learn more than what was called for in just a pass. I'm very grateful to them. 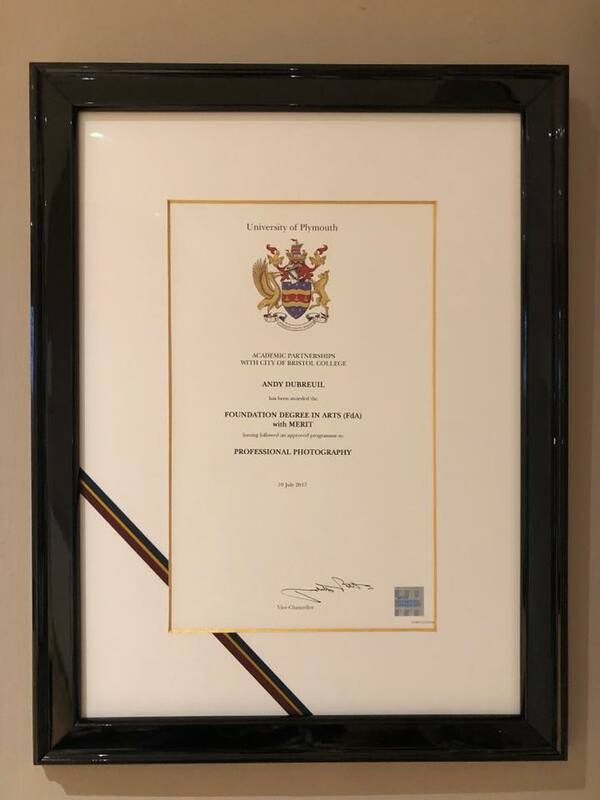 In my home, my degree certificate sits proudly framed next to one of my portraits, which was part of my final pieces of work for the end of the course. It reminds me why do what do, and gives me strength when health pushes back. When you go out to get an SLR or DSLR, you have some knowledge of what theses cameras are about. For many, start out with a lens kit, its a way the retailers can get you hooked up with a camera body and lens to start out with. I had done a lot of research by reading forums, reviews and watching YouTube videos. When you look at whats out there, certain names comes to the forefront like Canon and Nikon. But at the time I had read about Sony mirrorless camera and sort of grabbed my attention, it was an all new design, and today Sony Mirrorless cameras are only just been replicated by the likes Nikon and Canon, as they see the advantages. So my first real camera was the Sony A65 with a 18-55mm lens, this was my starting point in my photography. If I was truthful, I had no idea what to photograph, but I found that looking through the lens I could see the world differently. My first outing was down to the docks in the city centre of Bristol, and I would go along the waterside and photograph wide across the river, the dockside cranes, the boats, all the usual kind of stuff. But I read about the different modes like aperture, shutter, auto modes and for most would say stick with aperture mode, which I did for sometime. Aperture is great for during the day, but as you get into the evening the shutter speed at f8 and above gave a slower shutter speed so my images became blurred and just looked awful. Then I looked at the manual mode, the option that allows to change all the setting to help bring out the image you were looking for. The first few months was about learning about the camera, and as I learned the images became more normal to a degree, but they were still not perfect. But the more I looked through the viewfinder the world became almost microscopic in detail, I began to see light and shadows, colour and detail, angles that made things become objects of interest. Then I began to see people, their faces with lines and age, colour and texture of cloths, hair that whispered in the wind, everything was becoming magnified in my vision. Showing images I had taken, to the world of social media, is a big thing that can make or break you. Having people you don't know say something negative about your image that you are so proud of, and saying you’ve made mistakes in the way you’ve taken it, or how you’ve edited can be crushing, as there is always someone that knows better, because of experience, but if its done in a positive way that makes you look at what their saying, can make you want to do better next time. One of HDR images, I need to go back there are re-photograph this place. When I got my camera, HDR was the new in thing, and software was available to explore doing HDR images. At the time I thought HDR was cool looking, but when I look back and see how over baked my images were, it almost feels embarrassing to look at. I guess at that point, I had lost my way to what I was initially seeing that was paramount to making good photos. People on social media that I had grown to know became social media friends, they were just names with avatars, where polite about my photos and encouraging, but I didn’t really know them, I saw their work and was inspired by many of them. It hadn’t been a year yet since I had my camera, but one day I guess I woke-up and thought if I was to carry on taking photos, I needed to learn properly what I was doing and what possibilities were out there for me to get better and where I could take my photography. So I embarked on a FDA course in photography that would give a degree at the end of it, and hopefully make me a better photographer and use that vision that I first saw through the lens to make me better and images that others would love to view. Photography in the manual side of things is having a camera, with a lens attached, choosing some settings that suits your need of what you see through the viewfinder and pressing a button, then you have a copy of what you saw through the viewfinder. It’s as simple as that with the manual side of the machine thats made up of things made by man and constructed together to make the device we call a camera, but how did someone work out that all theses things would make something that millions would use to capture a moment for themselves, or as part of their business and become established for there images? ‘Vision’. Over centuries, people have had the vision to see pass the paintbrush, to figure out with many obstacles how to capture a scene and put it onto glass and then, to paper, to film and to digitally make an image thats based on 0’s and 1’s, which is the bases of computers that we know to today. All have had a vision of photography as the end product to make images. The image, is not defined by anything, its not singular, its not based around any form and can even reach outside our own planet, solar system and near into space itself. But it’s the vision of each of us on how we see things, its an individual thing based on how we think about something that makes sense to us firstly, which we then try to then get others to see same way we do. For the most part, the viewer sees lines, textures, colours, shadow and light, motion, things that they relate to, but its a snippet of the original scene that the photographer has controlled within the space that is limit by the lens and camera used in the first instance. The thing is today, everyone can take a photo, and to them its a good image, if not then they can hit delete and retake, but the retake has to be better than what has just passed and deleted, and is the vision of what they see that has to be better. Vision is everything in an image. The word selfie hasn’t actually been around that long, it was first recorded back in 2001 when a group of Australians created a website and uploaded the first digital self portrait onto the internet, and then on the 13th of September 2002, the first recorded published use of the term “selfie” to describe a self portrait photograph occurred on the Australian Internet forum (ABC Online). The word selfie was crowned Oxford Dictionaries’ Word of the Year in 2013. This word, this idea of the image, has allowed companies to form or utilise the word and idea of the selfie, to have smartphones to have forward facing cameras to take selfies, social media platforms like Instagram, Twitter, Facebook, Snapchat, Pinterest and LinkedIn just to name a few. The selfie is probably the most taken image around the whole world, and there are those that have made their fortune by selling the idea of how best to take a selfie, and actually uploading the selfies numerous amounts of times per a day, that makes them extremely influential in the social media platform. Some have even had exhibitions laid on to show off their work. Some in the world of photography, would not call this photography, but then when photography first began there were those that thought photography had no place in the world of art or exhibitions around the world. In less than 20yrs, there has been this explosion of images in the billions or more that has taken the world by storm in photography, and is seen as part of photography that is excepted as photography to many, yet the vision is of oneself or with a small group of other people expanded by the selfie stick, because of the maximum distance one can hold the device away from themselves to capture the image. Some have taken to push the boundaries of the selfie by way of a mirror, as bizarre as it may seem for one to photograph themselves taking a selfie, the new dawn of the selfie it may be. The selfie is a moment in ones life, which can be spontaneous or critically made with thought of the background as way to show “I was here” moment. A snapshot that put together with hundreds if not thousands, tells the story of ones life, day by day, hour by hour. A celebration for that person that documents in a way that photography was really never thought of to be used in this way. The popularity of the selfie is not for everyone, as the younger generation are the ones from 2001 have grown up with the introduction of the self portrait image. As I look back at my own history of images, it was my parents or other family members that had taken images of me as I grew up, with less and less as I got older, maybe because my parents were not into photography in such a big way unlike other people I know, which are of the same age as me. It seems a bit hit and miss to how much of your childhood is captured by others. I have just a couple of images of me as a baby, yet today I see my children taking photos of their children at least once a day if not more. There seems to be an importance to photograph our family and the moments that document their lives that they can look back on, in such fine detail, which can be of the morning, afternoon and evening of each day, from the day they were born. To me this is fascinating because its a form of photography that has no care about the how, where, light, shadow, depth of field, composition to the image, just that its taken in that moment to document a life as it grows and grows, to only look back on as a vision of that moment. Being the vision of oneself or as a member of something like a family or group.